You can download the Adjustable Bed Buyers Guide instantly as a digital guide. View the Adjustable Bed Buyers Guide Online Catalogue Now! The Adjustamatic beds and chairs are designed with your needs and flexibility in mind – so you'll always be able to face the day ahead with a spring in your step. 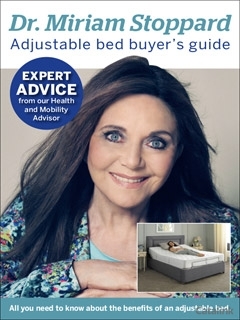 You'll get invaluable tips and advice on purchasing your perfect bed from Dr. Miriam Stoppard OBE when you request the guide today! Whether you want to combat a medical condition or simply improve your night's sleep, Adjustamatic are committed to providing you with the highest level of quality and comfort at every stage. Every Adjustable Bed and Riser Recliner Chair has a built–in therapeutic NHC Cyclo Therapy® massage technology, which allows you to enjoy the benefits of a deep relaxing massage in the comfort of your own home. Flexible settings and controls are designed to deliver whatever remedy you need. Choose a lower setting to relieve aches and pains or a higher setting for a relaxing and sleep–inducing massage. In the morning you will feel truly invigorated for the day ahead. Request the Adjustamatic Bed Buyers Guide now for a full range of invigorating options. Adjustable Bed Buyers Guide Kenneth M. said: no prices included!